Drawing on themes of the natural and the hybrid, Natural Fallacy is a group show curated by 229Collective in collaboration with Aether Art Projects. In philosophy, natural fallacy is the conclusion that value in terms of good and bad is based in nature. What is natural is good, therefore what is unnatural is bad. The notion of natural fallacy comes as a broken concept, the invalidity of a fallacy is integral to its meaning. This show addresses how that idea can be re-presented and complicated in contemporary composite forms and with the integration of technology. The show combines 2D, 3D, and sound works with an emphasis on mixed media. Participating artists include Frank Adams, Eames Armstrong, Tim Campbell, Christopher Cunetto, Sara Diamond, Dan Gray, Chandi Kelley, Stephanie Kwak, Marina Litvinskaya, Gabriel Mellan, Jennifer Nugent, Haniya Rae, Jordan Sanders, Najva Sol, and Gregory Vita. Closing reception: Friday, August 10, from 6-9pm. Exhibition will be open Saturdays 12-5pm, Sundays 11am-4pm, and all other times by appointment. 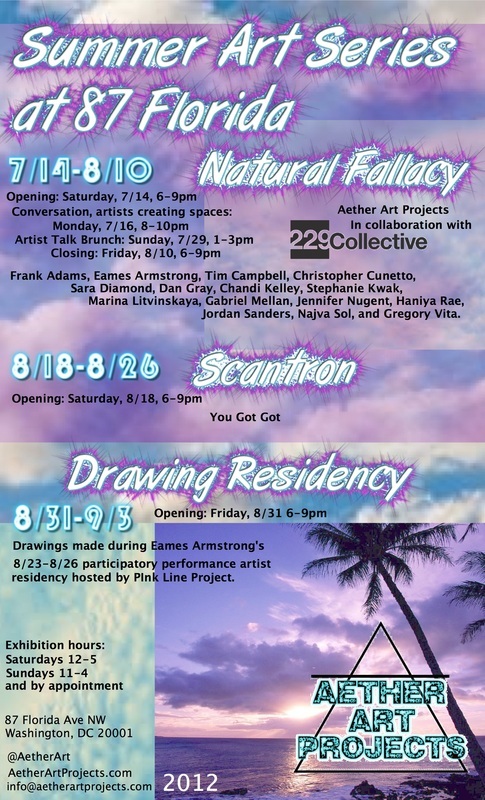 ScanTron, curated by the artist militia YouGotGot will launch on August 18, 2012 at 87FLORIDA. For ScanTron, the founding fathers have chosen eight "artists" to represent the brotherhood of YouGotGot. ScanTron is a design experience that will challenge the viewer to question his or her aesthetic surroundings. 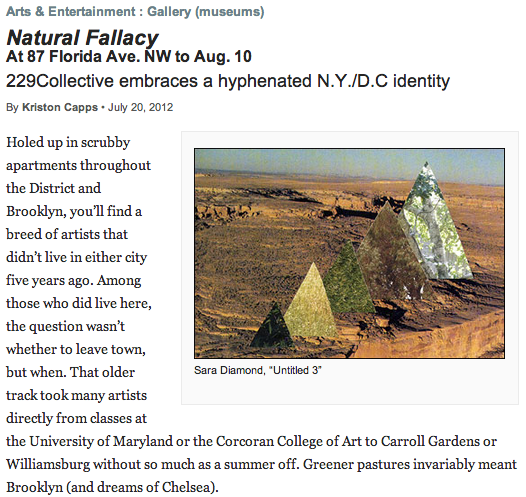 A spearheading exhibition, ScanTron calls for the simplification of the traditional group show. In contrast to the prevalence of exhibitions of unrelated work shown under a disconnected theme, ScanTron applies the standardizing formula of the age-old testing system. This deliberate technique unifies and coheres work by seven multi-disciplinary artists and one scholar, none recent additions to the DC art scene. The selected will include: Calder Brannock, Stephen Crouch, Joesph Hale, Deshaundon Jeanes, Mark Keeler, Aaron Lim, Pradip Mennon, and Joshua Padarathsingh. Drawing show comprised exclusively of works created during an artist residency at the Pink Line Project Headquarters, 8/23-8/26.